Affluence for a few, democracy for no one, nationalism for everyone – and then what? Hans-Peter Martin, author of the international bestseller The Globalisation Trap, with his new book is providing an equally explosive analysis: the system is crashing. Robotics and digitalisation will increase the existing enormous inequality in society even further; even in the West, not only wide sections of the population are turning their backs on democracy but also the elite. The financial crisis is still bubbling away merrily, the threat of trade wars is hanging over our heads, the climate change is displaying its extremes, and so is China. Populists and authoritarian regimes will use the private mass of data of each and every one of us in order to cement their power. The new nationalism is seen by many as a cure-all but it ends in war. Game Over. Free play uncertain. And then what? The author suggests various unconventional ways out. 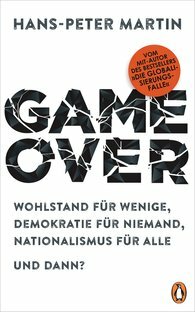 "Game Over is a great achievement. Impressive and very well written, this book will engender debate."